I must confess that I've never been a huge fan of the Zelda series. If that invalidates everything I've ever had to say about video games, then so be it, and please move along. Personally, I've always found them too open-ended for my tastes. Getting to the fun of them requires that the player be adventurous and self-motivated, and that's really not the sort of experience I look for when I play video games. I usually turn to video games as an escape, not just from the setting of real life, but from the listlessness of the everyday, and, for relief, I tend to prefer more structured and linear affairs, where the goal is specified before the journey even begins. That said, I still have a lot of respect for the series and how consistently well it succeeds according to its own aims. I keep telling myself that, one of these days, I'm going to marathon all of the main installments, since, despite not having played most of them, I do have access to all of them, in one form or another. The one installment that I did play all the way through and thoroughly enjoy was The Legend of Zelda: Four Swords Adventures for the Nintendo GameCube. 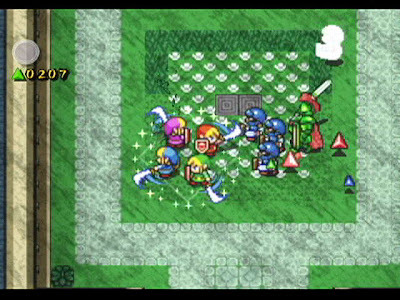 Released in 2004, Four Swords Adventures was the sequel to 2002's Four Swords, which had originally been a bonus game bundled on the Game Boy Advance on the same cartridge as the GBA port of A Link to the Past. Like the first Four Swords, Four Swords Adventures was a cooperative multiplayer take on the conventional 2-D top-down formula of the classic Zelda titles. The game was aesthetically evocative of the 16-bit A Link to the Past, the most celebrated of the 2-D Zelda titles, but it actually featured a redone Link sprite, with smoother animations, moves, and sound effects inspired by the character's then current The Wind Waker GameCube incarnation. On his quest through such familiar locales as Death Mountain and the Lost Woods, Link could collect the usual Zelda items, such as the bow and arrow, bombs, and the boomerang to help him combat the various Octoroks and Tektites. In terms of structure, it was, to my delight, a much more directed affair than previous Zelda titles. Rather than supplying a unified overworld, the episodic "Hyrulean Adventure" campaign was divided into a linear series of self-contained stages. The change in format was surely necessitated by the new multiplayer focus, as, while the more open-world design of the traditional titles could provide intensely personal experiences of exploration, shorter segments of action tend to be better-suited for multiplayer sessions. The multiplayer mode utilized the same unlikely hardware setup as Final Fantasy Crystal Chronicles, requiring each of up to four players to have a GBA and a GameCube-Game Boy Advance Cable allowing the handheld to function as a controller with a built-in second screen. 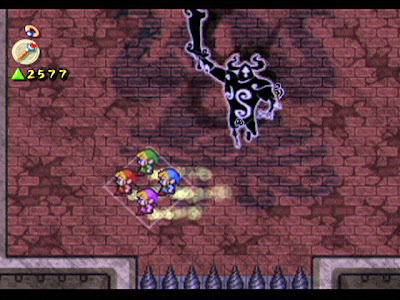 Most of the action took place on the GameCube screen, and players would only turn to the GBA when they ventured off the main map, such as when they entered a cave or traveled into the Dark World. 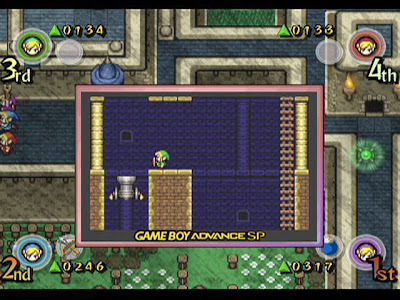 This two-screen setup formed the basis of many of the game's more inspired puzzles. Most memorably, I recall one clever arrangement that required a player to hit an off-screen target using the bow and arrow. From the shooter's position, the target could not actually be seen, so another player would have to separately enter an adjacent cave that provided a side view of the target and shot on the GBA screen. From there, the "spotter," as it were, would then have to direct the sniper's aim, telling them to move to a higher or lower position as needed. Moments like that made a far more compelling case for connectivity than anything in Crystal Chronicles, but they were arguably still just tricks, and the co-op gameplay of Four Swords Adventures, rooted as it was in the fundamentally brilliant single-player Zelda design, would have been superb even without them. Far from being a hack-and-slash, Hyrulean Adventure featured remarkably varied gameplay and objectives. There was a stealth stage, for example, where the Links had to avoid spotlights while infiltrating Hyrule Castle. As a Metal Gear veteran, I felt confident in my sneaking abilities, but, I must confess, my lust for treasure made me easy prey for one particular trap, as, in my careless pursuit of a normal-looking but conspicuously placed chest, I ended up triggering an alarm that, aside from screwing over my team, earned me the ire of my fellow Links. The game also brought the always popular horseback riding to 2-D, and players would eventually come upon "Tingle's Tower," where the creepy fairy-like man would invite them to participate in races, among other amusing mini-games. Finally, there were the fantastic boss battles, including the last fight, which, in multiplayer, played out like a cooperative variation on "hot potato." As much as it emphasized cooperation, however, the campaign also encouraged a somewhat cutthroat competitive aspect, as, at the end of every stage, the game would calculate who collected the most Force Gems, who defeated the most enemies, and who died the most. In games with three or four players, players would also be asked to vote for which of their friends had been the most helpful and which had been the least, and those secret ballots could factor crucially into the final tally. As a basic rule, players who greedily hogged all the Force Gems during the stage were not likely to win a lot of votes in their favor from their comrades at the end of the stage. Unlike the original Four Swords, the campaign in Four Swords Adventure could still be enjoyed in single-player, in the likely event that one couldn't wrangle up any friends with GBAs and connectivity cables. Regardless of the number of players, there would always be four Links, and the extra Links could be directed to form up for combat or to get in position for puzzles of the typical multi-switch variety. For the trickier puzzles, such as the aforementioned bow and arrow one, the single player would have to switch off between Links. In addition to the main campaign, Four Swords Adventure also included "Shadow Battle," a competitive arena mode, where up to four players battled one another to the last man, or until time expired. Items would pop up to spice things up, but the still simple mechanics of the combat didn't lend the mode much longevity. While I more fondly remember Crystal Chronicles for being a much weightier and more epic experience, I would argue that Four Swords Adventures was more mechanically inventive and elegantly designed. But the two were not really competitors. Rather, they together made the case for Nintendo's connectivity experiment, though, evidently, not strongly enough, as Four Swords Adventures would end up being the last of only three titles to be specifically built around use of the GC-GBA Cable, the other one being Pac-Man vs., a much smaller affair that required only one GBA. While Four Swords Adventures and Crystal Chronicles were excellent games, both among my best experiences on the GameCube, a mere two titles perhaps could not justify for most players the steep expense of the complicated setup. I can't imagine a DS port or sequel would be too difficult to produce, however, and I'd personally rather play that over most of the co-op games available on that or any system. In addition to Hyrulean Adventure and Shadow Battle, the Japanese release also included a third mode, "Navi's Trackers," which was originally slated to appear in the English versions as "Tetra's Trackers." In the mode, players apparently competed in a timed treasure hunt, while Tetra from The Wind Waker narrated the action. Supposedly, the mode was cut from the English releases due to difficulties in translating the play-by-play audio, which could identify players by the two-character names they themselves provided. Since the Japanese language is based on a syllabary, with each hiragana or katakana character representing one vowel or consonant-vowel syllable, the game's real-time speech generator could pronounce players' names with little difficulty. The more complex phonetic structures of English would probably have required an impossibly more sophisticated input mechanism to avoid mangling renderings and pronunciations of names. A common name like "Henry," for example, while only two syllables, would require three characters ("he" + "n" + "ri") to render in Japanese script, making it impossible to input via the two-character system of the game. I don't see why they couldn't have just switched to generic references, such as "Player 1" and "Player 2," but, without having played the mode, I don't know how much of a draw the feature was. Perhaps it was the main and only attraction of the mode. Still, I personally suspect it was more likely a case of Nintendo being conservative as usual when it comes to the localization budget. "How convenient! I can use the same picture."